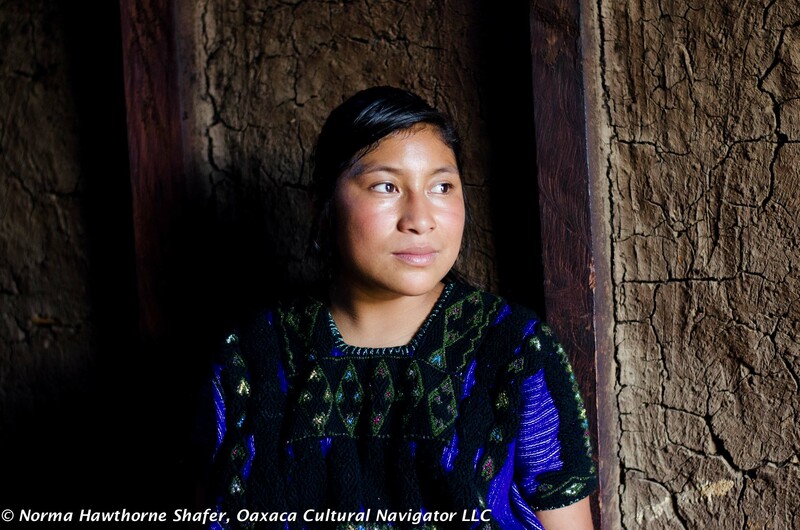 They speak Tzotzil here in the Maya highlands of Chiapas, Mexico. San Lorenzo Zinacantan is a village nestled in a beautiful valley about thirty minutes from San San Cristobal de Las Casas. 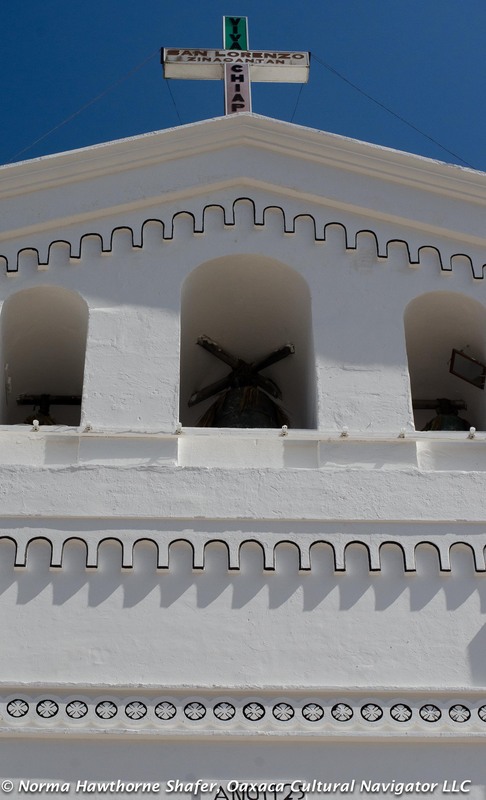 It is a popular Sunday tourist destination combined with a visit to the mystical church at San Juan Chamula (which I will write about in another post), just ten minutes apart. 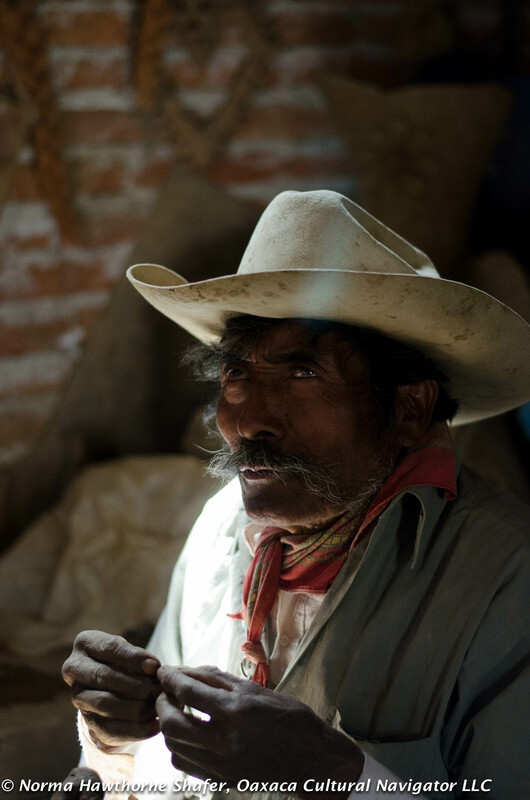 Zinacantan people yielded to the Spanish during the conquest. They enjoyed more favors and received fertile land in exchange for their loyalty. 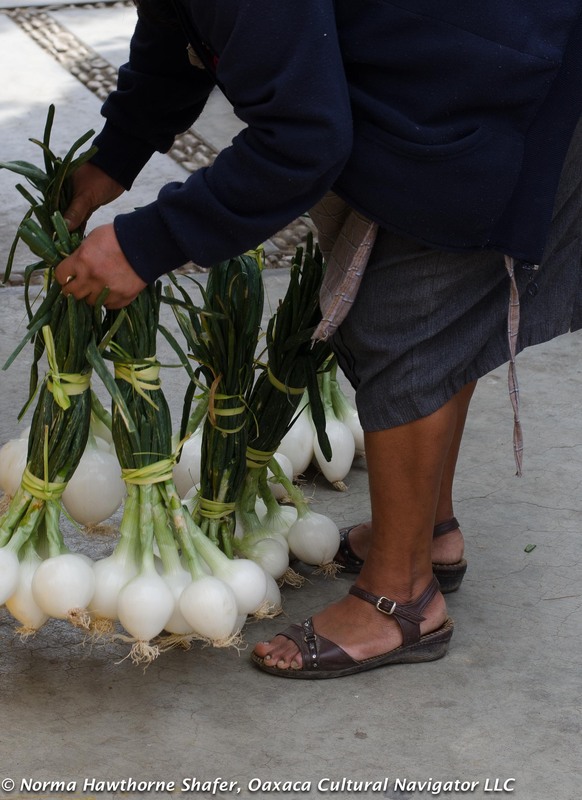 Today, the Zinacantan hillside is dotted with greenhouses where flowers grow in abundance to decorate church and home altars, and are a key part of festivals. 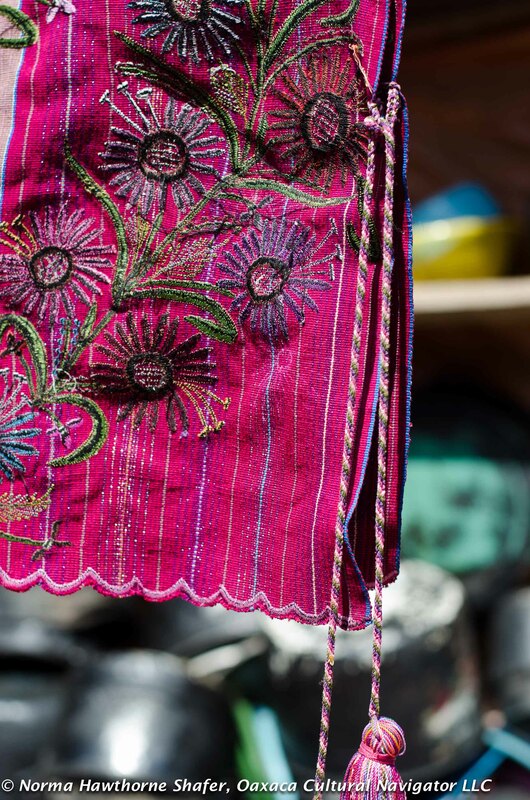 The village replicates these flowers in their embroidery that embellish cloth created on back strap looms. 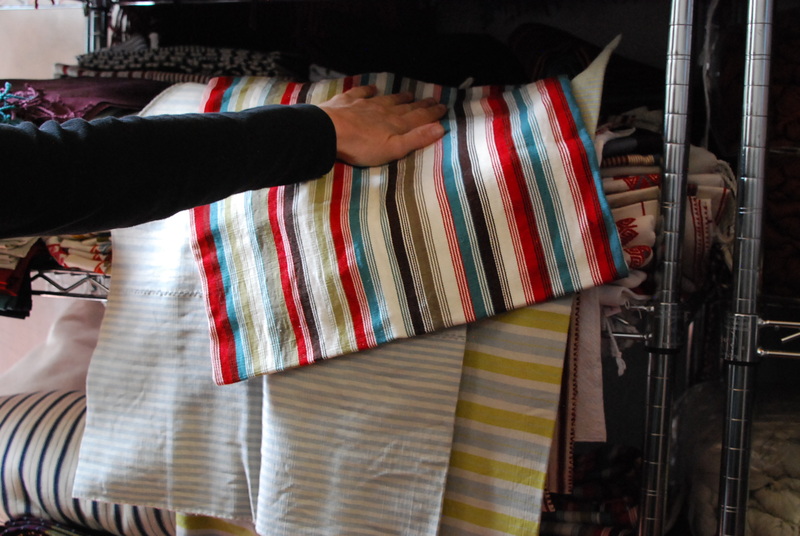 Over the years we have seen the patterns change from simple red and white striped cloth to sparkly textiles that incorporate synthetic glitzy threads of gold and silver. 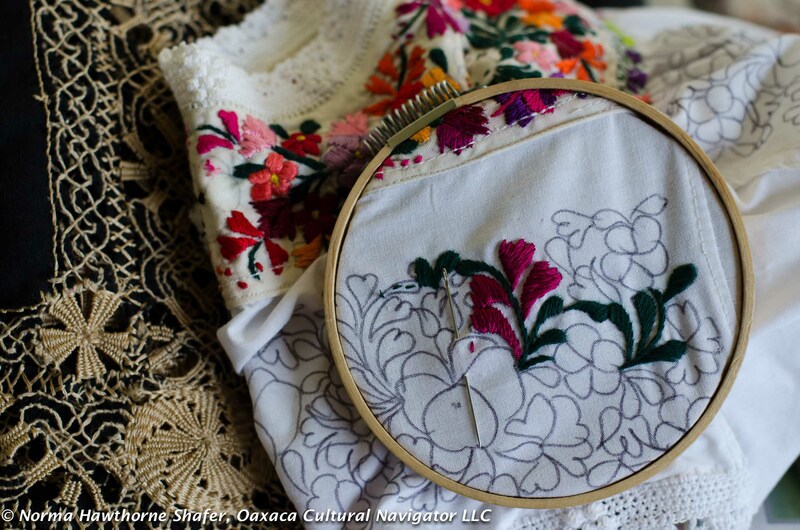 Much of the embroidery is now machine stitched, though the designs are guided by expert hands. 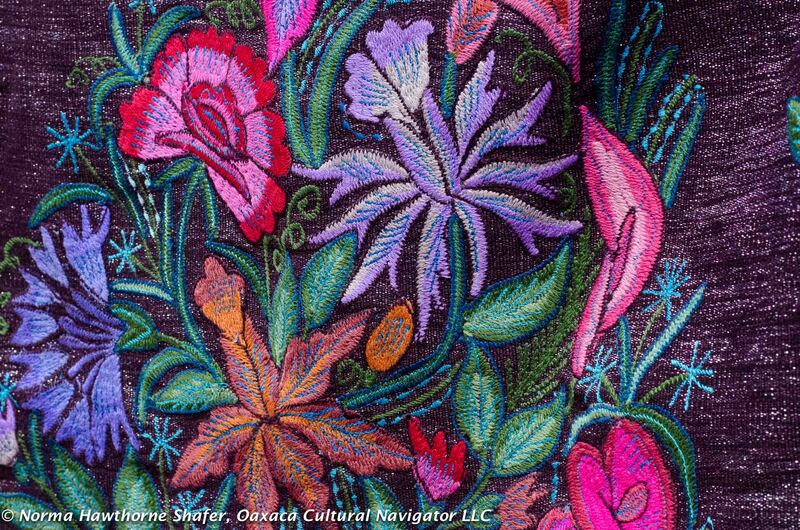 I’ve been coming to San Cristobal de Las Casas for years searching for a chal embroidered by hand to no avail. 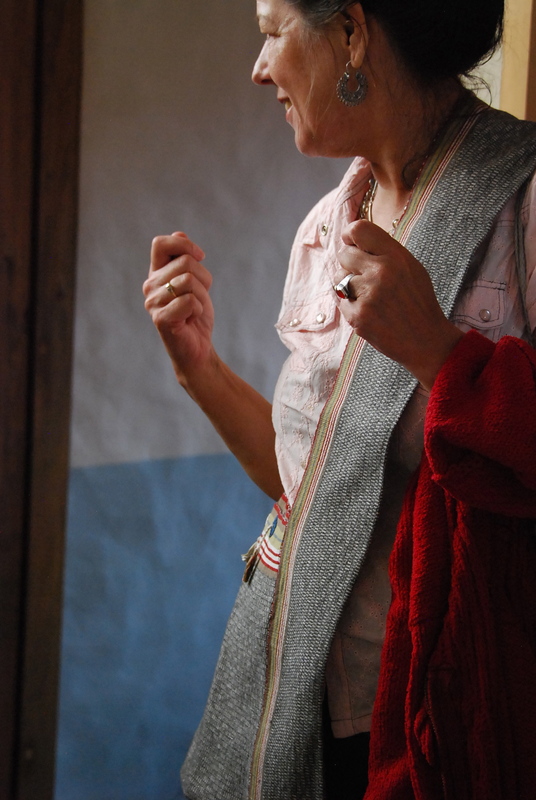 This time, Patrick, our guide took us to the home of Antonia, one of Zinacantan’s most accomplished weavers and embroiderers. 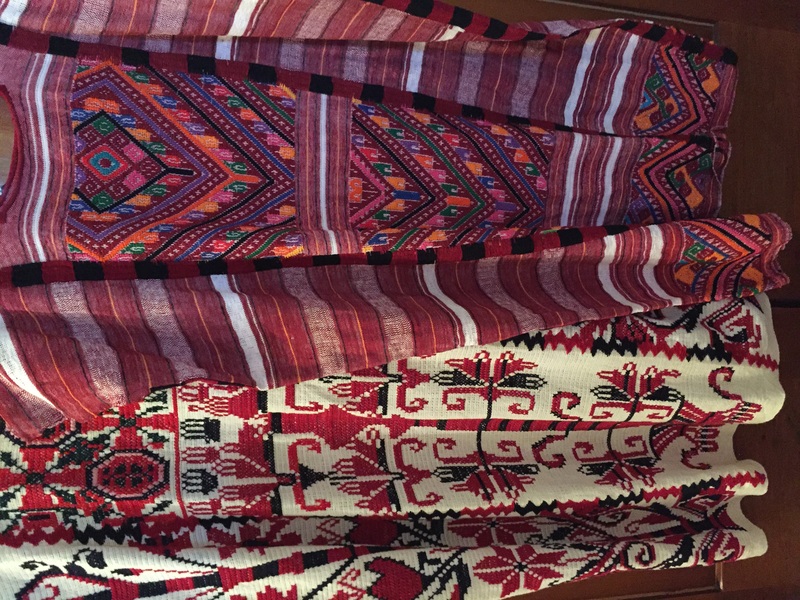 Among the hundred chals (shawl or tzute) available for purchase, I found a blue one all hand embroidered. 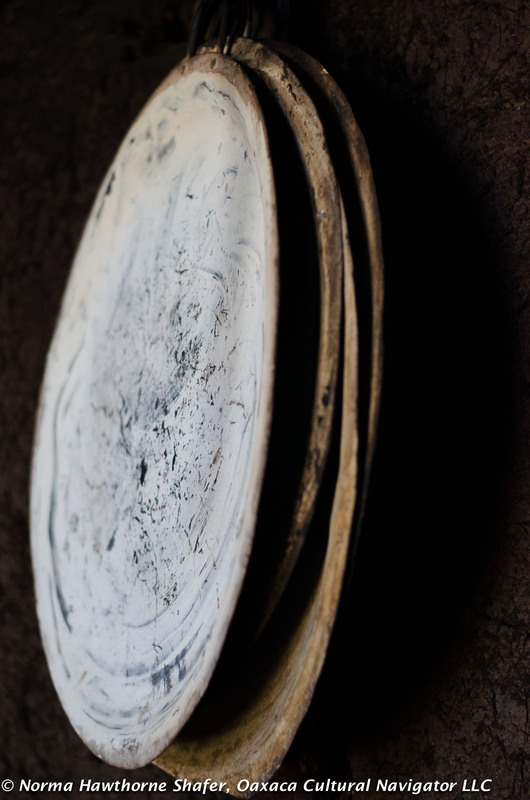 Technology is winning out over the made by hand ethos. Identity is defined externally by the indigenous garment. 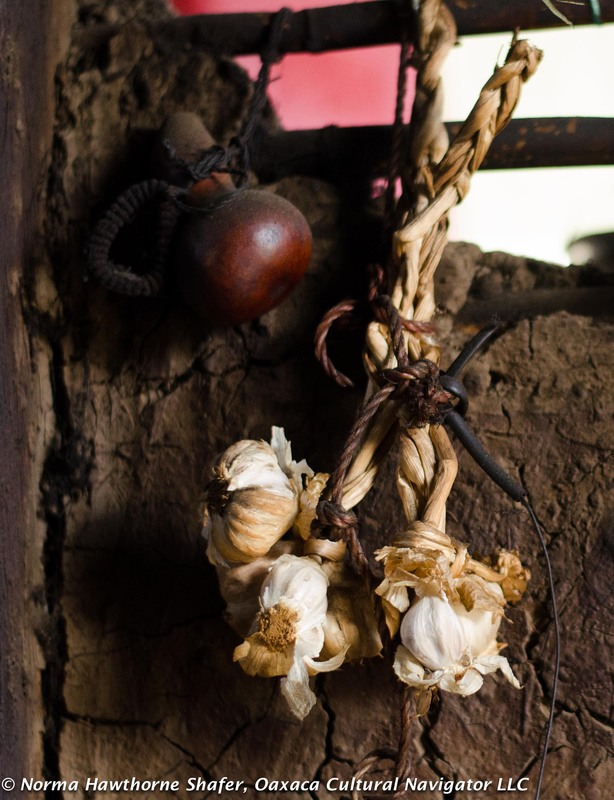 Some say the Spanish imposed this upon local people in order to know where they came from and to keep them in their place. 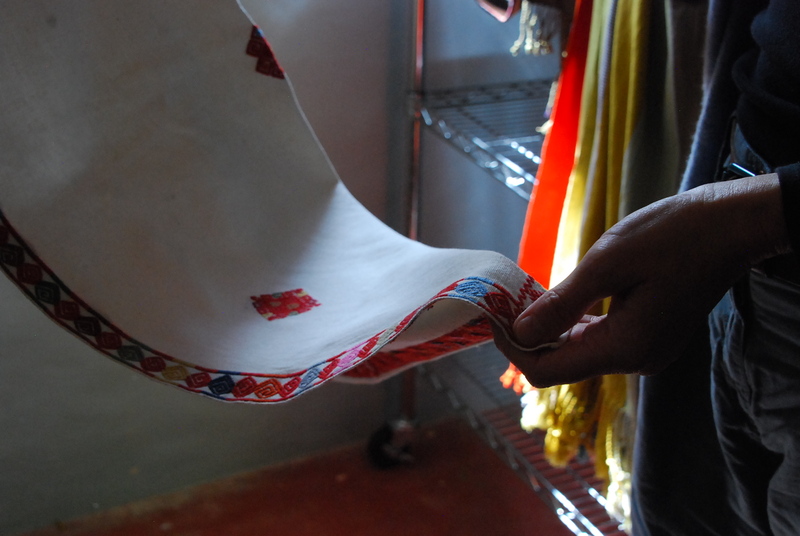 Others say the design of the garment endures because of cultural pride. The young woman above is from the village of Chenalho. I can tell because of the design of her beautiful huipil. 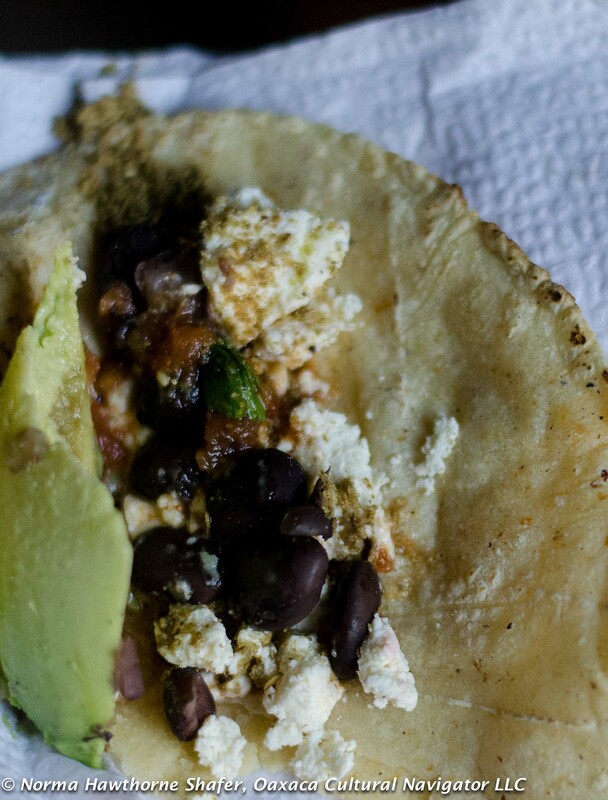 She is the tortilla maker at Antonia’s home, who keeps the fire going, makes us a fresh quesadilla of local cheese, cured chorizo, avocado and homemade salsa to remember the visit. Food is memory, too. Nothing is wasted, not even the smoke. 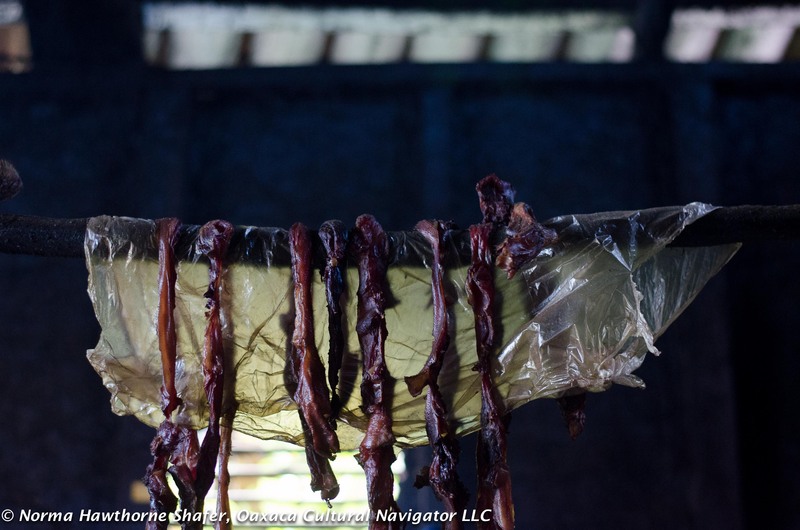 It curls up from the comal to cure the meats that hang above it. 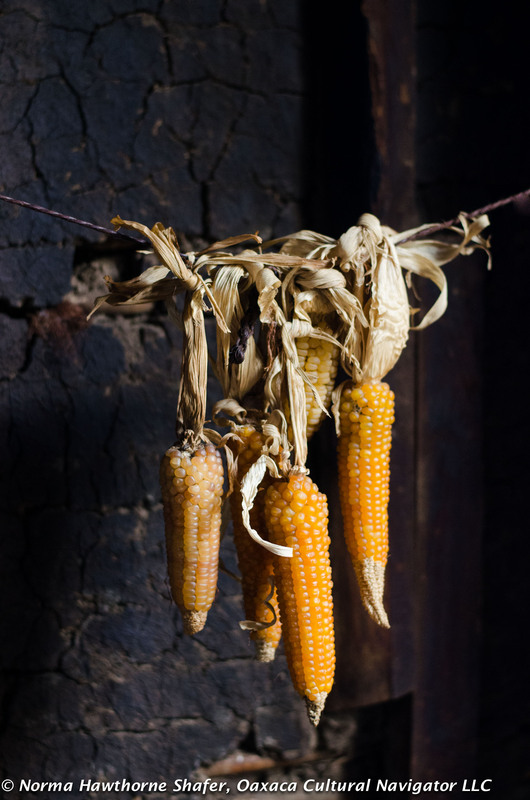 The corn is criollo, locally grown and ground by hand, pure and wholesome. Here in the shadowy adobe kitchen there is magic. It is impossible to take photographs inside the church at Zinacantan. It is forbidden and cameras can be confiscated if you are found to violate this. Can you imagine a church altar spilling over with flowers from ceiling to floor, fresh, with an aroma of lilies, roses, gardenias and lilacs. The swirl of scent is like an infusion of incense, designed perhaps to bring one closer to god. 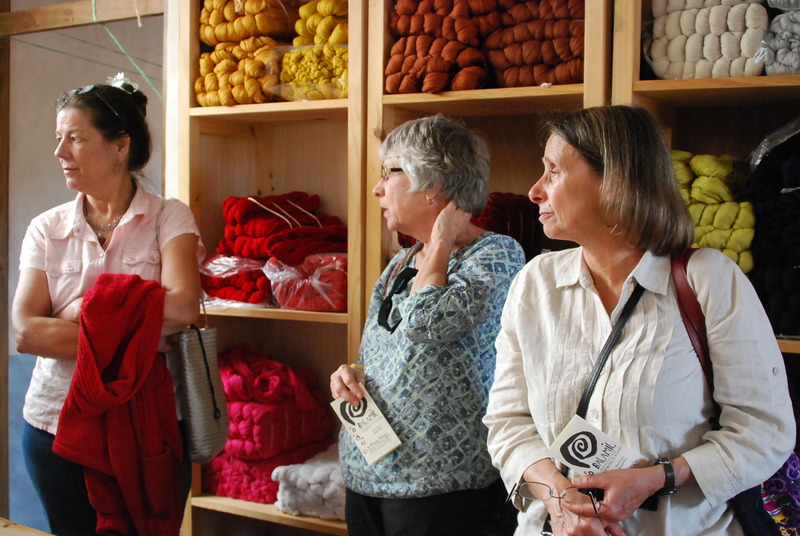 I organized this art and archeology study tour for Penland School of Crafts in North Carolina. 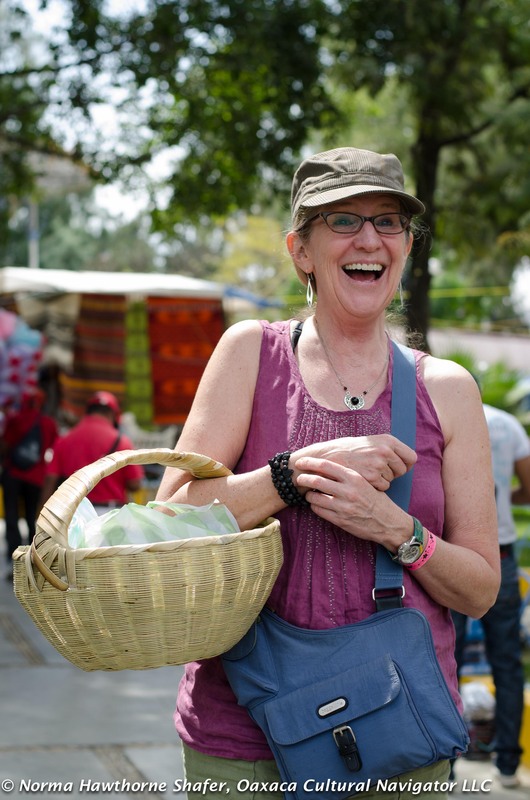 If you have a small group interested in coming to Oaxaca or Chiapas, please contact me. I have over 35 years experience organizing award-winning educational programs for some of America’s most respected universities. 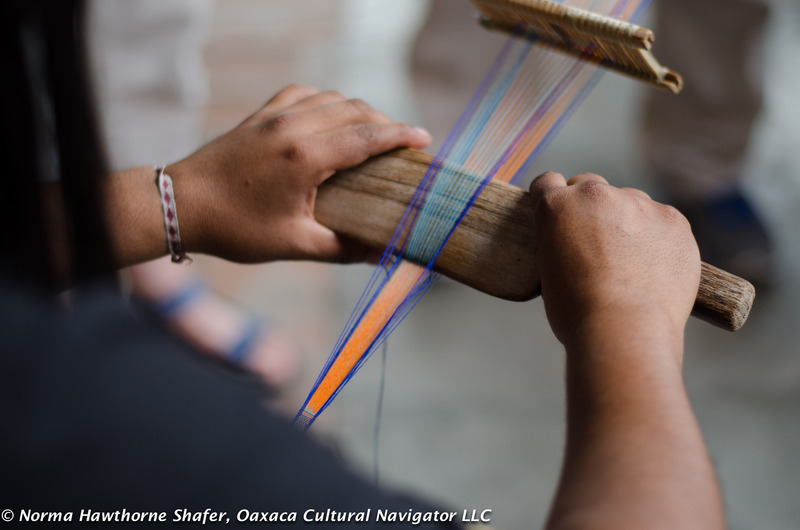 Our Penland School of Crafts group travels through Oaxaca arts and artisan villages this week. 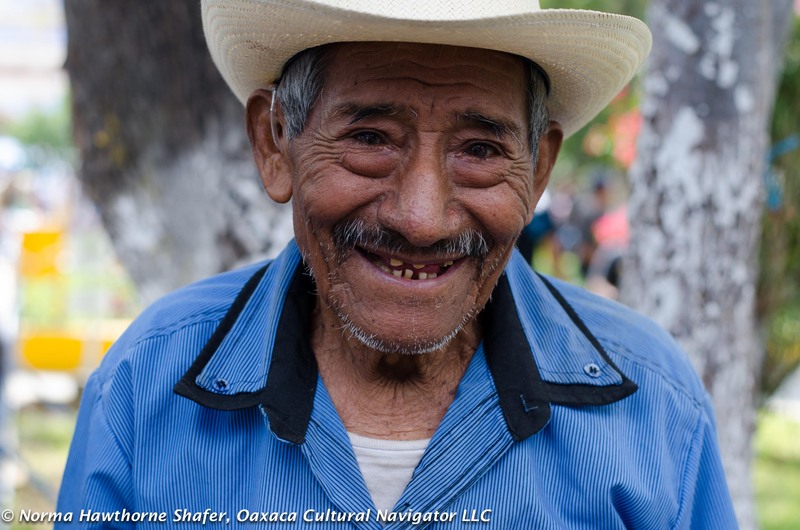 One destination is the regional town of Ocotlan de Morales where we met artist Rodolfo Morales through the murals he painted in the municipal building during the mid-century. 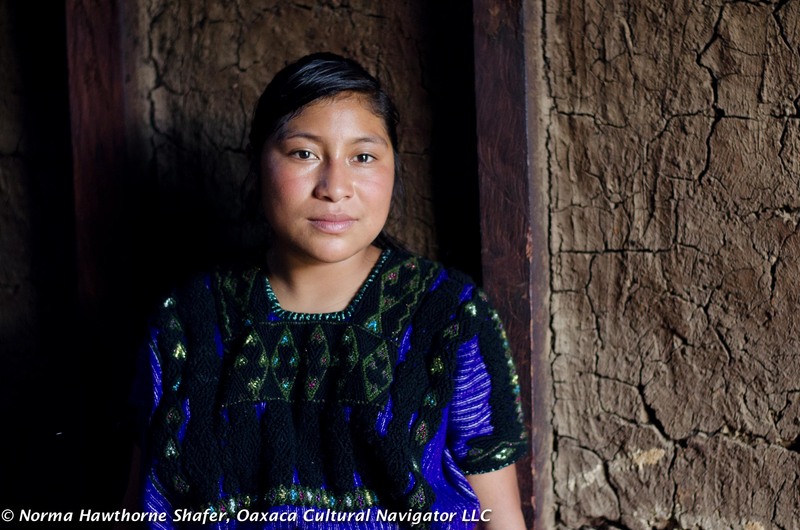 These frescoes depict the rich agricultural tradition of the Ocotlan valley and honors the labor of the campesinos — the people who till, plant and harvest. 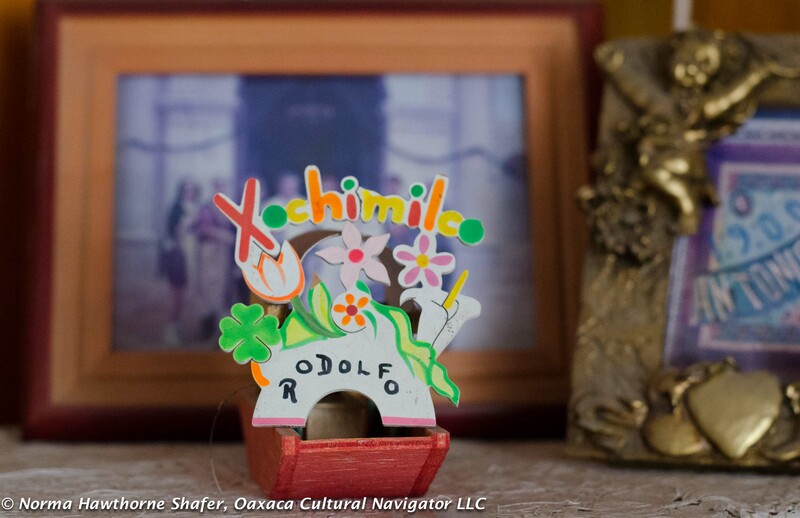 The Morales home is a treasure trove of 1930’s and 1940’s collectibles and folk art. 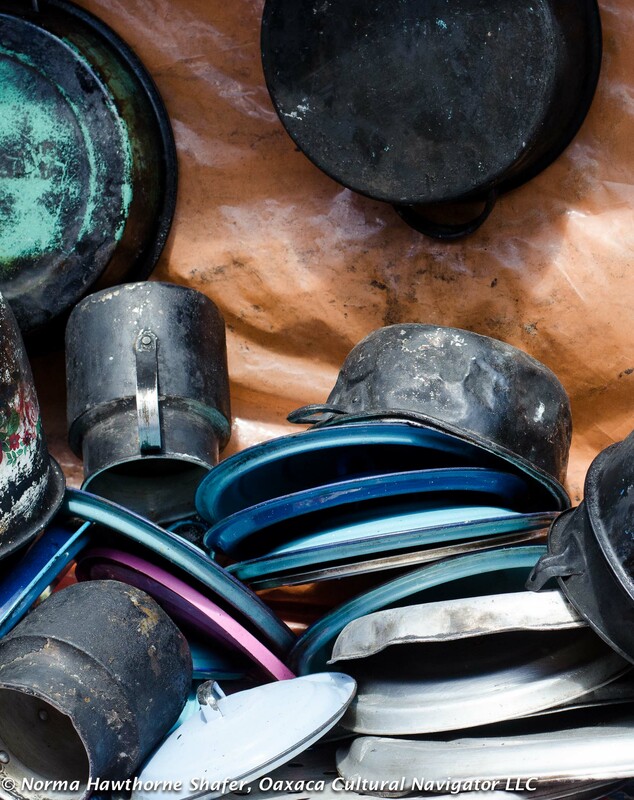 It includes a traditional tile kitchen with walls adorned in tiny clay cooking vessels. Every room opens to a central, plant-filled patio. 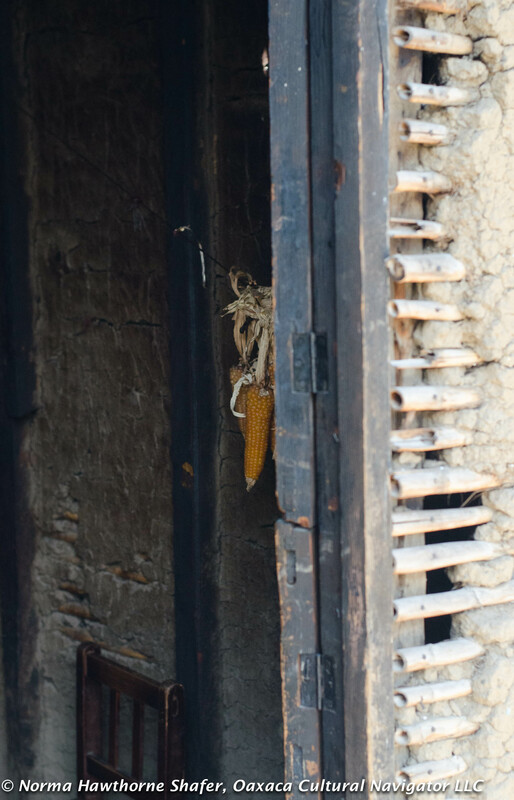 The primary caretaker of the home is nephew Alberto Morales, who greeted us at the front gate and let us inside. He is also the head of the Morales Foundation that keeps the house renovated and open to the public. On our request, he generously opened the private bedroom and studio where his uncle slept and worked. 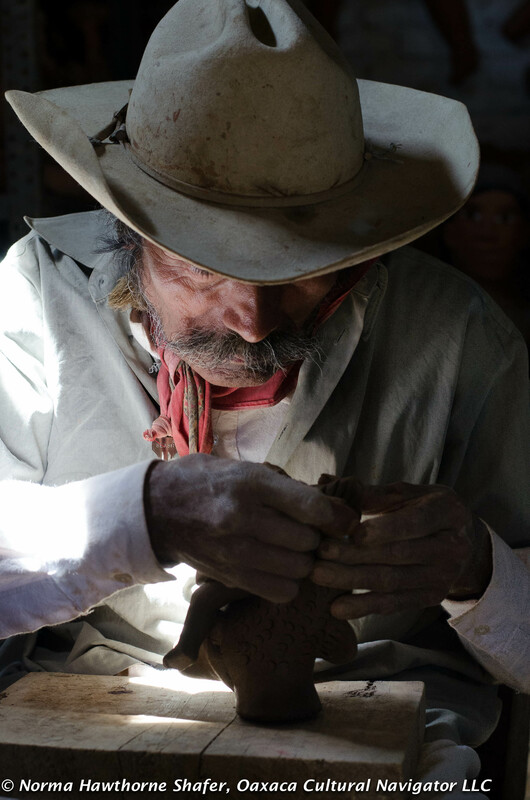 we went off to San Antonino Castillo Velasco to visit folk art potter Jose Garcia Antonio. 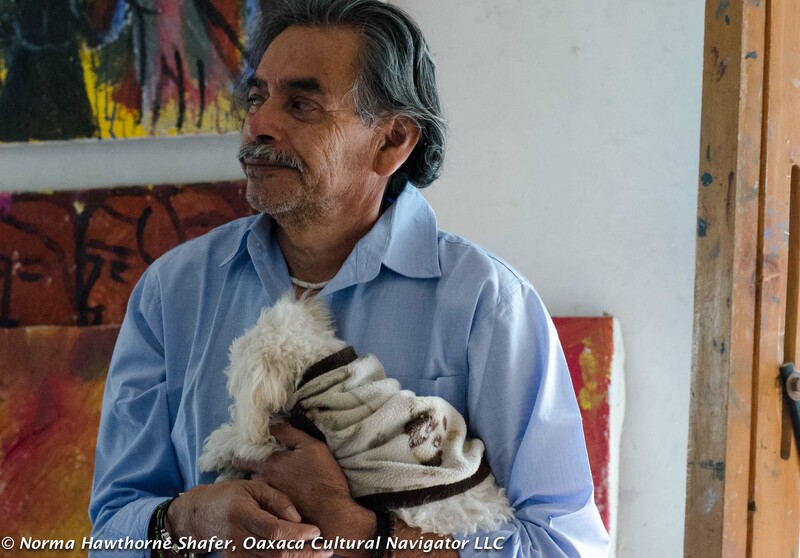 Jose and his family work in red clay sculpture and he is recognized as a Grand Master of Oaxaca Folk Art. 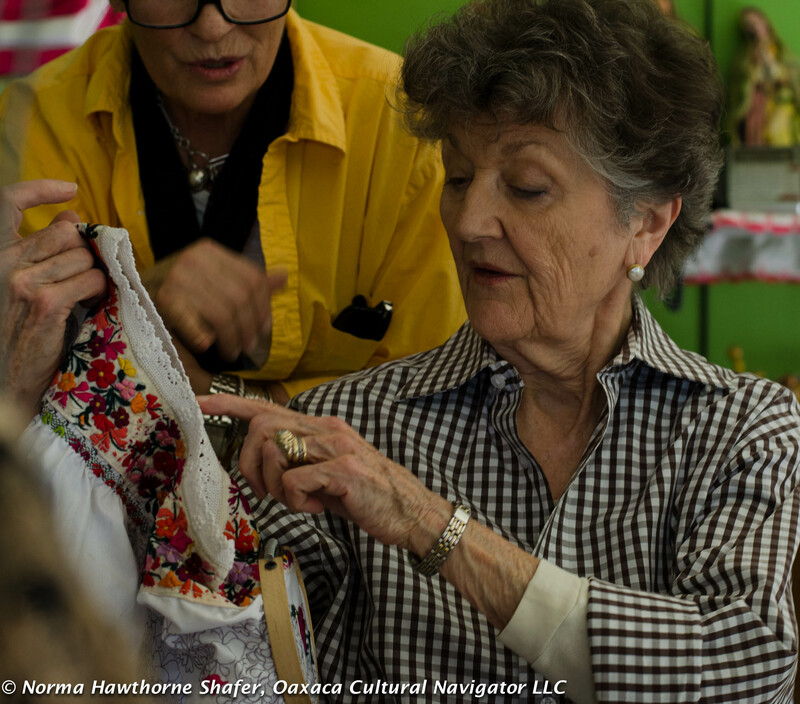 Next, a quick stop to the women’s embroidery cooperative. The quick stop became an hour-long shopping forage through the piles of gorgeous Oaxaca wedding dress style blouses and shirts, preceded by a demonstration about pattern making and stitching techniques. This coop is excellent quality with affordable prices! 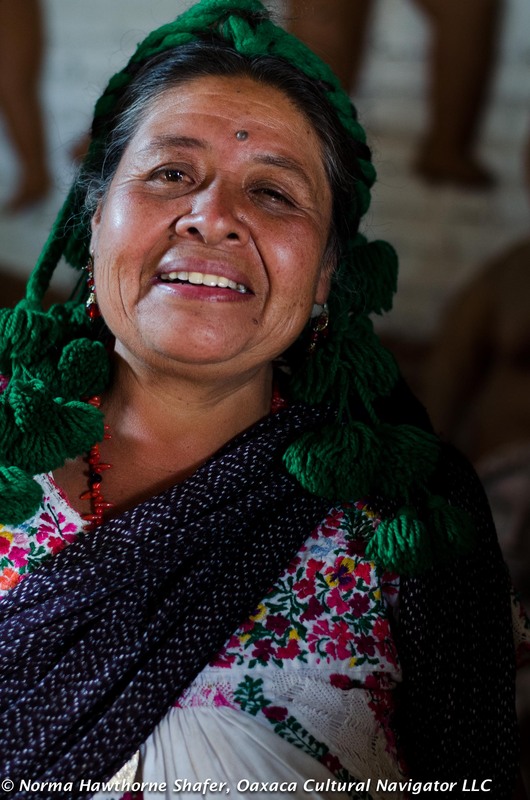 Fortified by a delicious lunch at Azucenas Zapotecas at the San Martin Tilcajete crossroads, we backtracked to Santo Tomas Jalieza for a visit with Grand Master of Oaxaca Folk Art weaving family of Abigail Mendoza. A long day, but not too long to return to enjoy a lovely dinner at Casa Crespo. I put together a tasting menu with Oscar Carrizosa made up of an array of first courses. It was just perfect. 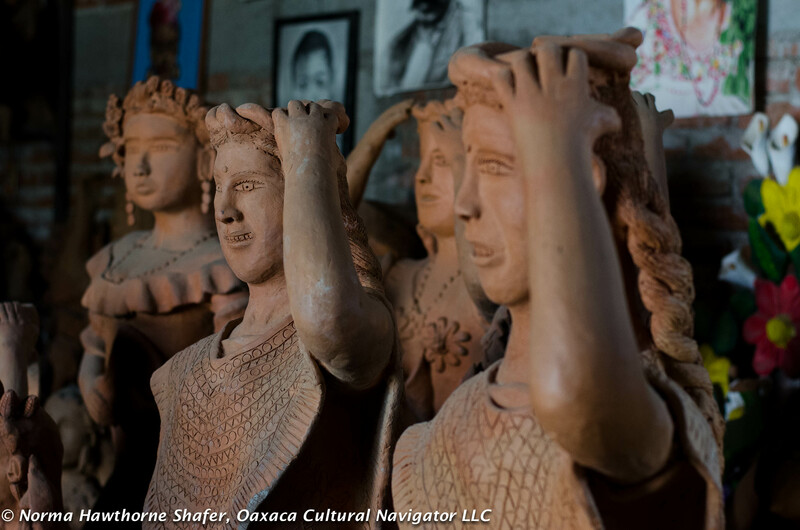 Oaxaca Cultural Navigator organizes arts workshop study tours for groups of up to ten people. Please contact us for more information. Norma Hawthorne Shafer has over 30 years experience developing award-winning university programs. 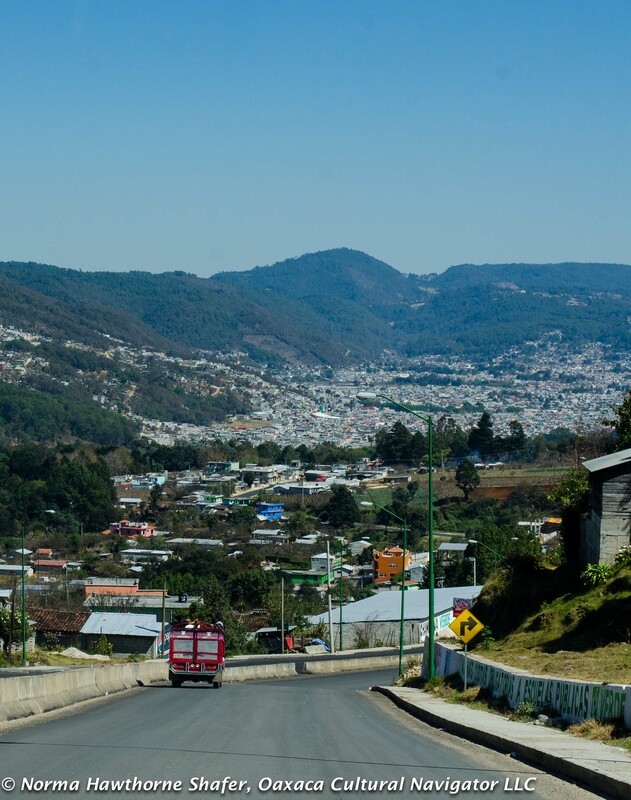 After calling ahead and making an appointment, we took a taxi to the outskirts of San Cristobal de las Casas at the end of a dirt road to find the headquarters of Camino de los Altos. 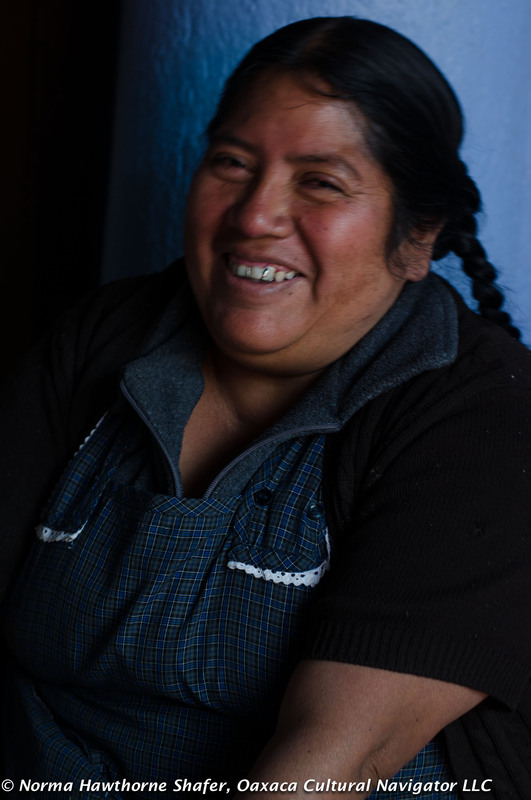 This is a cooperative of 130 weavers who make extraordinary textiles. 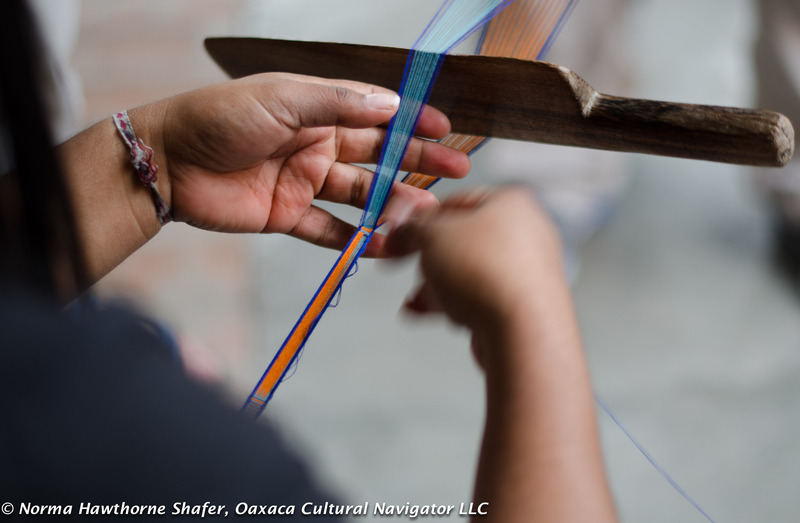 They will be exhibiting and selling their work at the Museo Textil de Oaxaca from Friday through Sunday, February 17-19, 2012. 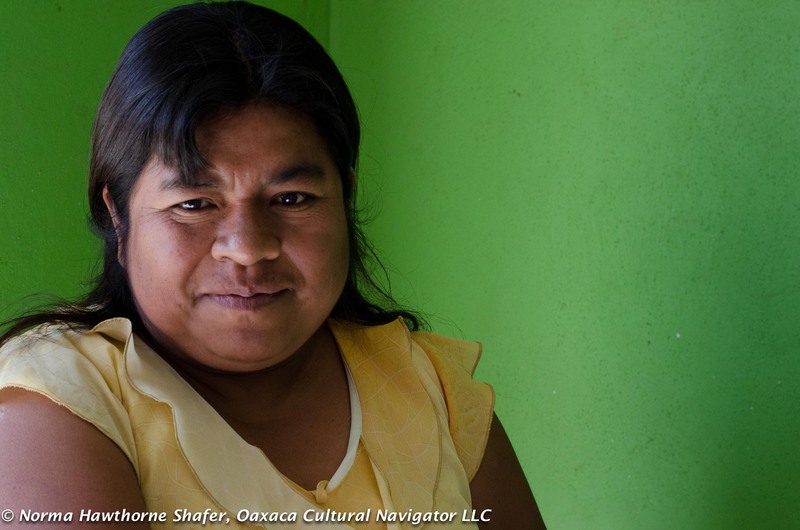 If you are in Oaxaca, you won’t want to miss this event! 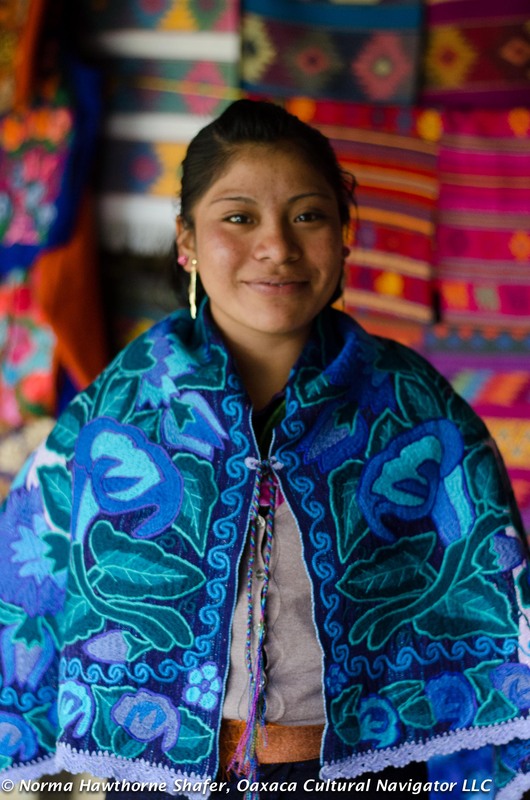 The cooperative began in the mid-1990’s by eight French designers who had a passion for Mayan traditions, textiles, and indigenous design. El Camino selects ancient traditional colors and re-imagines them. 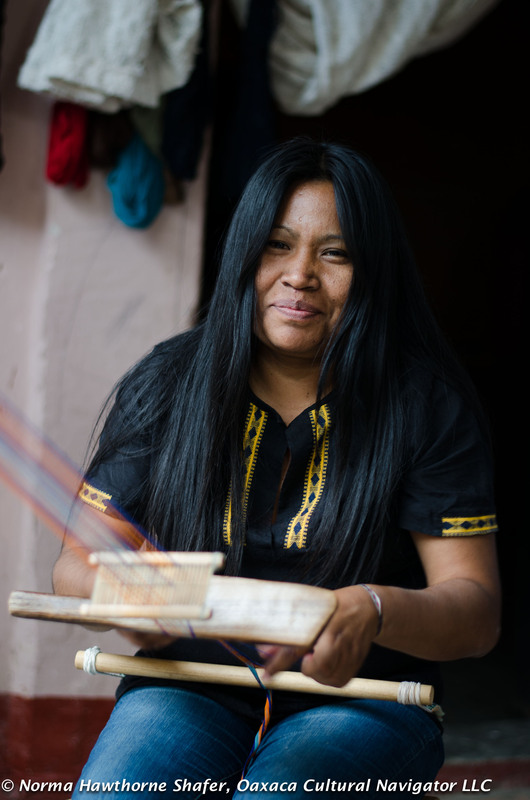 They produce bags, children’s clothing, pillow covers, scarves, shawls, table cloths, runners, napkins, and dish towels on sturdy, highest quality fabric that is hand-woven on back strap looms in five Chiapas weaving villages. Six sales are held each year in Paris and at other selected locations around the world. 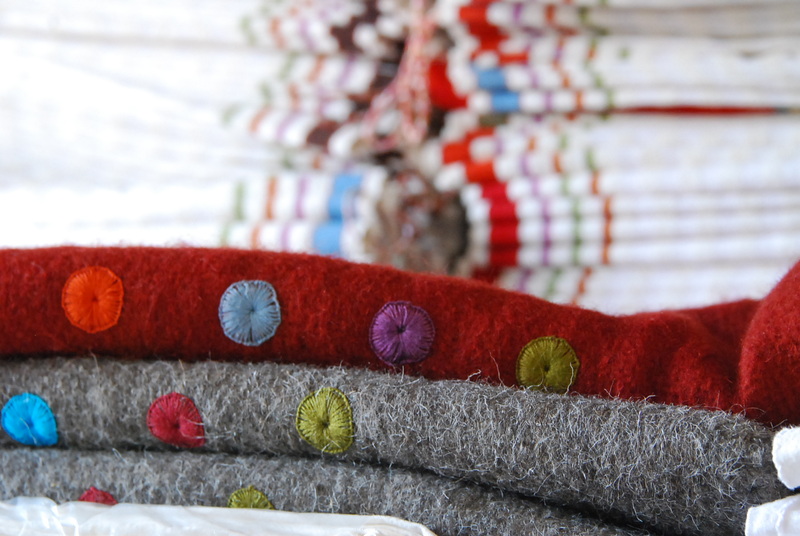 Wool pillow covers can be the natural color of the sheep or dyed with either palo de Brazil or cochineal to yield a rich red. 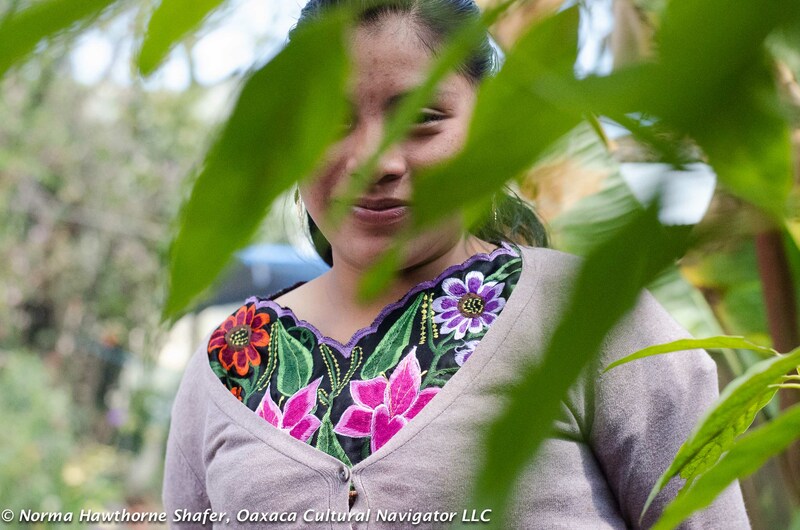 Mayan women then embellish them with traditional hand-embroidered designs. 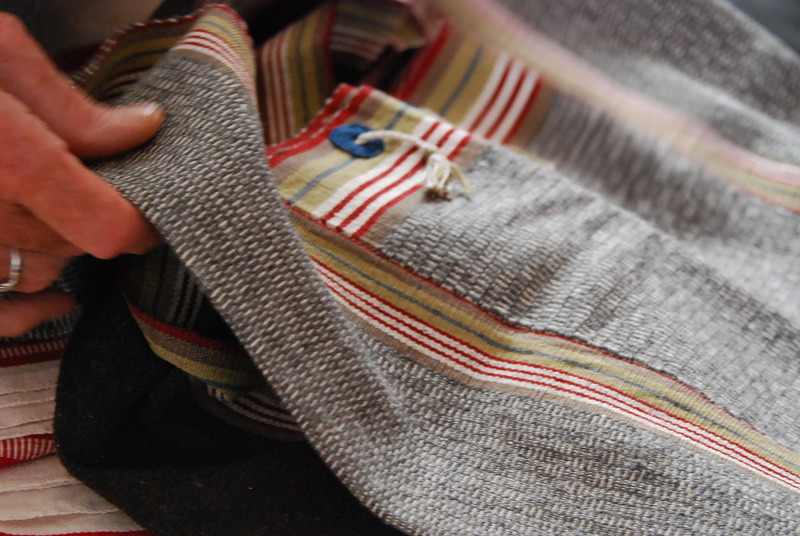 The cotton is dyed with industrial color. 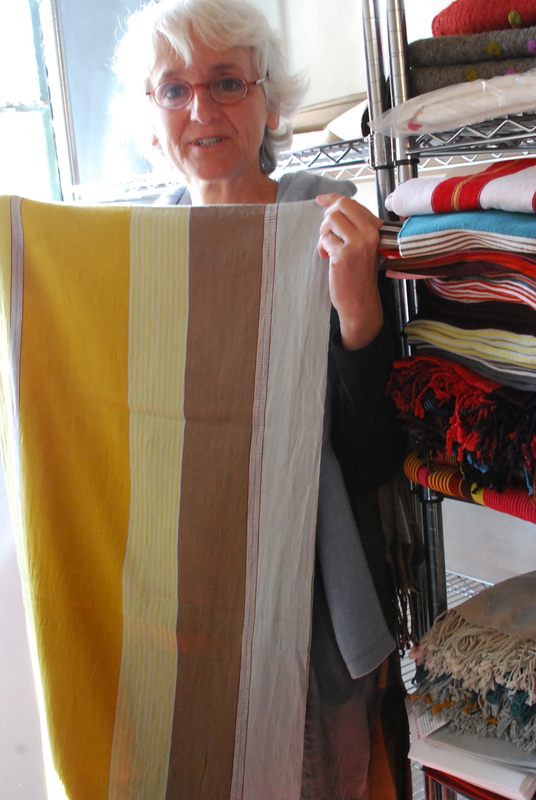 The color combinations are juicy and intense, and based upon traditional weaving patterns, too. As a cooperative, the members meet together to decide next steps, new design and color directions, and pattern innovations. Their commitment is to each other — everyone must have work. 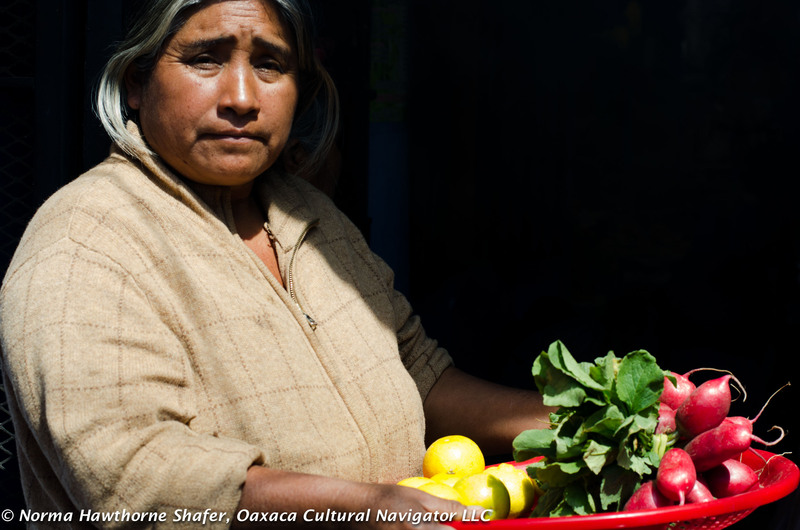 The marketplace speaks, so together they determine what needs to be altered, adapted, changed or discontinued. 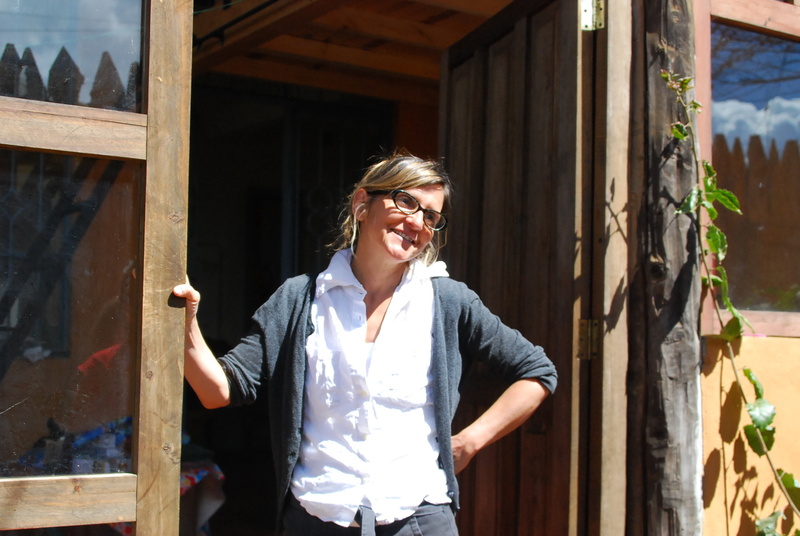 El Camino de los Altos operates through the sale of their work and the support of a French foundation, and are able to employ four full-time staff. 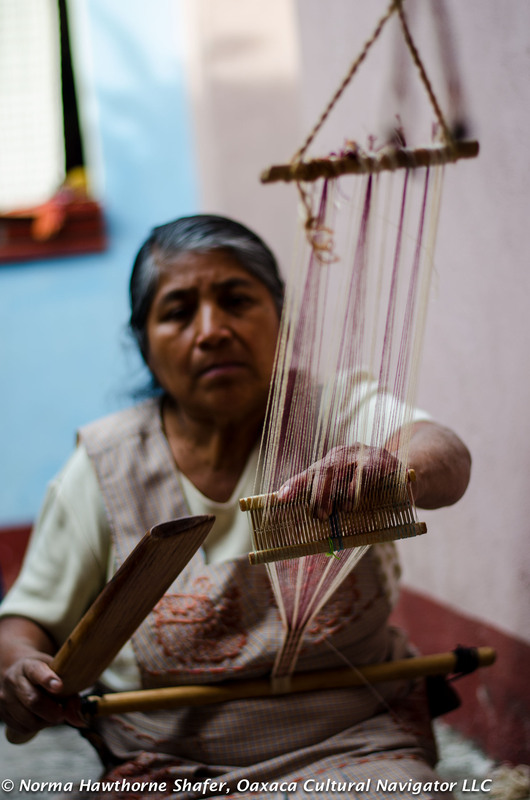 The money they earn goes directly to the weavers. 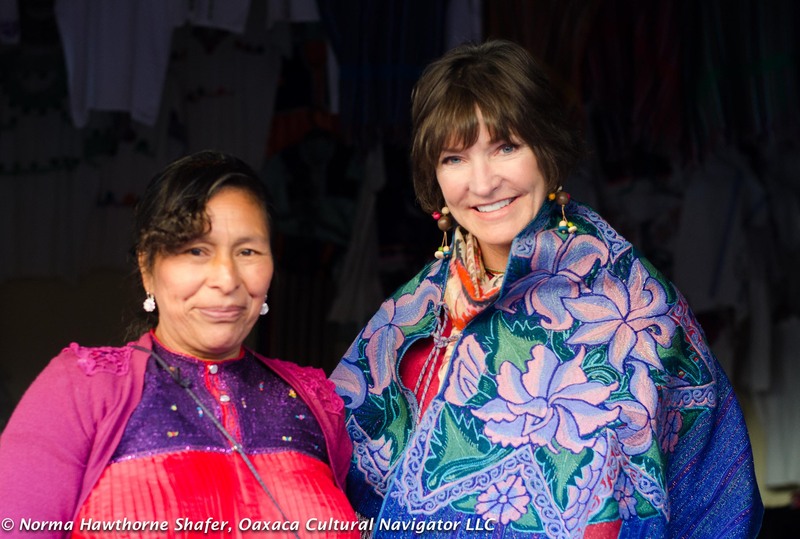 In addition, they are training indigenous women in marketing, sales, production, inventory control and other business development aspects that will ensure ongoing success. 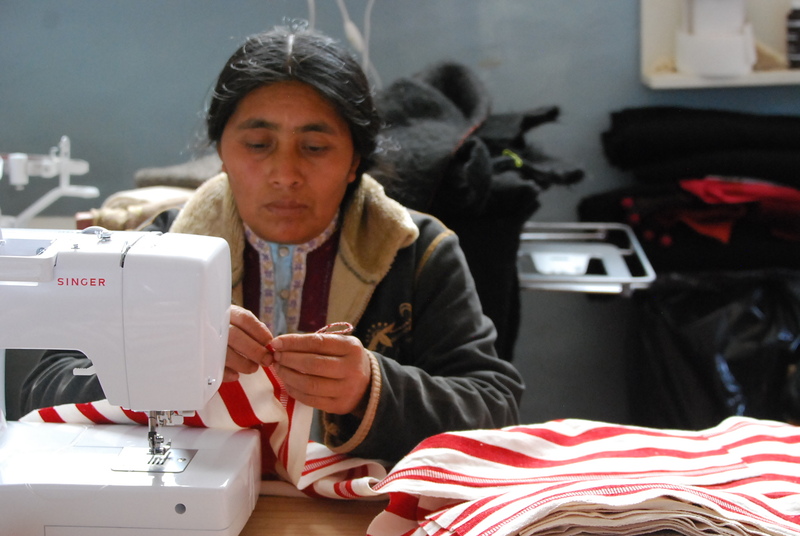 A Chiapas retail store, Madre Tierra, sells Camino de los Altos textiles. It is located across from the sweets market on Insurgentes in the courtyard behind the fabulous bakery that sells the most delicious whole grain onion garlic buns.